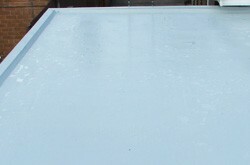 If you are interested in getting a GRP fibreglass flat roof, then contact us. We're specialists in the installation and repair of GRP fibreglass roofing, and we can offer friendly and honest advice for your flat roof as well as free estimates for your roofing needs. GRP fibreglass roofing should be carried out by specialists such as ourselves, so to talk to us about your flat roof requirements, call Glasgow 0141 340 9604 and we'll be more than happy to discuss your needs. GRP fibreglass is a great material for all flat roof installations and repairs because it is seamless meaning that you are reducing the risk of leaks, which can cause costly damage to the structure of your property. Don't take risks, call us today to get your home covered! We also offer a range of other materials including felt, rubber, tile and slate.